Like many of our readers, we love looking at maps. It is always interesting to study maps compiled by cartographers working in different countries and different languages. It can also be a great way to learn some new words and phrases in a foreign language. 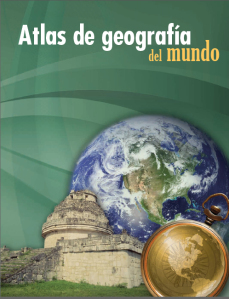 The lavishly illustrated atlas was prepared by experts from the Geography Institute of Mexico’s National University (UNAM). It is aimed at high school students and the maps are complemented by carefully selected info-graphics and informative text. Exploring these maps is a great way for native English speakers to improve their Spanish language geographic vocabulary! Thanks very much, very useful. This is Jalisco: video promoting the state of Jalisco ﻿The geography of the Spanish language: how important is Spanish around the world?